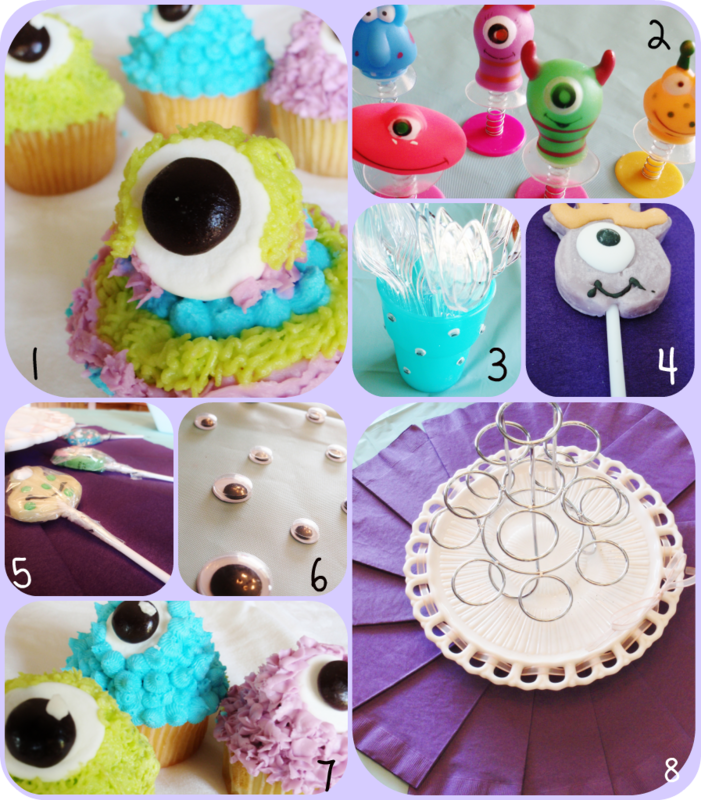 A Creative Cookie: Monster Mash Party Reveal! I had this party eons ago, I just never got to posting it! Today's the lucky day I reveal it! Have fun browsing these 'scary' fun ideas! all you have to do is cut off the corner of a marshmallow then stick on a Junior Mint! These were super easy. For the last cupcake, I did stripes of all three colors. That was the cupcake that went on top of the cupcake tree. Bought from here at $4.00/dozen! This place, Oriental Trading, has great party supplies and crafts for kids!!! I used these Monster Pop-Ups as prizes (winners get first pick), but they are awesome as favors as well! I needed a matching (purple + aqua) utensil holder. I grabbed a blue cup, and using washable Elmer's glue, I glued googly eyes all over it! I bought these here (Oriental Trading Co.). I have to say, the red suckers were a favorite! This was a common theme throughout the party. I organized a game (which the kids loved!) of a googly eye scavenger hunt. Before the party, I hid several large (smaller for older kids) googly eyes around the house. I hid about 5-9 googly eyes per person. Sometimes if the kids were bored or finished eating early, they would search for googly eyes. It was a great game that lasted throughout the party! Yep, more of them!!! Yum! This was probably the girliest part of the party (it was a girl party). I took purple napkins and made a giant ring of them around a cake platter that had pink ribbon (from previous tea parties) that wove in and out of the decorative edges. I placed a cupcake tree (I bought it from Taste Of Home, but I can't find the product on their site!) on top, which held all the monster cupcakes. That was it! I also bought some monster magnets that were fun! Most of the kids arranged the pieces in completely different ways (tossing the instructions!) and made unique monsters! Click here to see Oriental Trading's other monster products!